Kona's largest and most luxurious vessel! Stabilizers for a smooth ride. Accommodations for six people, three air-conditioned state rooms, three separate baths, finest quality tackle. 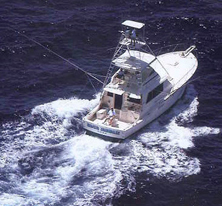 We specialize in fishing, boating, overnight, business, VIP and family trips. From trophy marlin to light tackle fishing to catered business meetings to family outings, we can accommodate your needs.